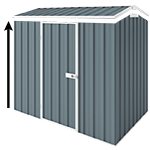 This Off the Wall shed is one of the latest to our massive range of slimline storage sheds and apart from the smart design it has another greatly attractive feature, it’s price tag. This 'Off The Wall' shed is one of the latest to our massive range of slimline storage sheds and apart from the smart design it has another greatly attractive feature, its price tag. Not having the back wall sheets enables us to save money on materials and that is all passed onto you, so you can save even more. This innovative and smart design shed is the best priced shed that you can get out there (and this is Australian made). Why would you pay for the back wall if you don’t need it? One less wall, less time to assemble. Concrete slab is not required and wall anchors are included in the pack. Would you prefer the same size shed with back walls? You can check it out here.